Graham has a clinical and research interest in the effect of exercise on the heart. He is Chair of the Healthy Heart UK research group which is introducing exercise training to children with congenital heart disease. He is Scientific Advisor to Marfan Association UK and Principle Investigator in a variety of studies on sudden death, Marfan syndrome and defibrillator development. His main clinical interest is in interventional electrophysiology in congenital heart disease. In 2008 he was recipient of the UK Arrhythmia Alliance Outstanding Contribution to Electrophysiology Award. In January 1993, Graham joined the Congenital Heart Unit in Cardiff where he helped set up the surgical service. In 1998 he crossed the Severn to join the Bristol Congenital Heart unit where he developed the Adult Congenital Heart unit and set up the cardiac obstetric service and inherited cardiac conditions service. 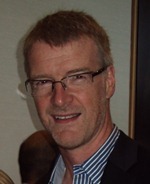 Since 2005, Graham has been Medical Director of Sports Cardiology UK a company specialising in the assessment and management of athletes with cardiac disease (www.sportscardiology.co.uk). This is part of an extended midlife crisis which will only be resolved when the Scottish Rugby team rise again to win the Grand Slam.